to the brink of parch and succumb. Resignation. A theme I read of late. You think it's because the end of the year brings it? 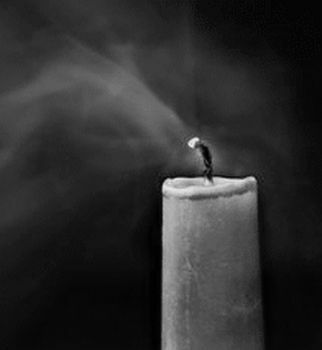 I love this image...the flame succumbed to the wind. Had it a choice against such power? Annie, not sure if it's due to the approaching year's end or possibly, a perceived impending sea-change. either way a restart seems imminent and oh, necessary (don't you think?). Here is to a beautiful, glimmering light into 2011! yes, Irina, it already shines, no? ... Happy New Year to you! !